Elizabeth Perry is a teacher, writer, and artist with a particular interest in creating relationships between material and digital worlds. She is a founding editor of the Pittsburgh Signs Project, an online public art project documenting the visual landscape of Western Pennsylvania. 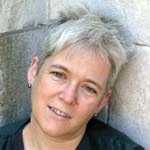 She is an author and editor of a book drawn from that experience, Pittsburgh Signs Project: 250 Signs of Western Pennsylvania, published by Carnegie Mellon University Press in 2009. Perry works at The Ellis School, in Pittsburgh, PA, where she helps teachers integrate technology into a PK-12 curriculum. She is also a founding member of Hack Pittsburgh, a new workspace where people can collaborate on art and technology projects. She has spoken and taught work- shops about blogging and other uses of social media both locally, at venues like the Mattress Factory Museum and the Technology and the Arts Conference at Carnegie Mellon University, and nationally, at conferences like BlogHer and She’s Geeky. Think Cool Thoughts, a children’s book she wrote, was published in 2005 by Clarion Books. Her formal background includes a BA in English from Yale, and an MFA in fiction writing and PhD in English from the University of Pittsburgh.